The National Archives has digitized thousands of documents, images, and movies related to Native American history and culture. This is the fourth in a series of blogs highlighting the records available online through the National Archives catalog. 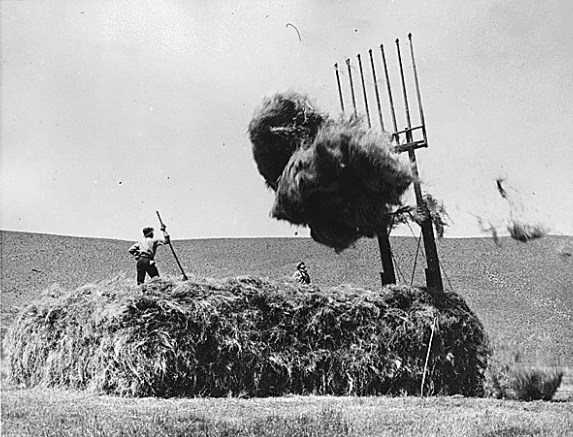 Hay operation at Duckwater Reservation (Idaho and Nevada). Gene Thompson (Mission) and Drew Mike (Piaute). 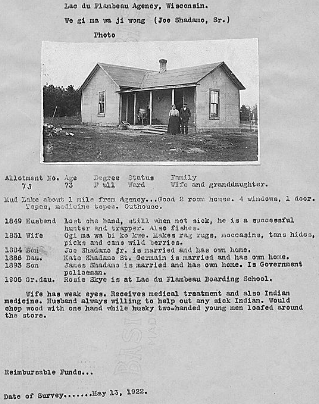 Federal agencies, especially the Bureau of Indian Affairs, documented the Native American residents of reservations as well as their living and working conditions. The photos in the entries document daily life, work (especially farming), construction projects, houses, reservation schools, and traditional crafts. Photographs, 1900-1960: 852 photographs mostly focusing on agriculture, land, and Civilian Conservation Corps-Indian Division projects created by the Rosebud Agency. Photographs, 1900-1960: 866 photographs, including photos of areas of the Fort Berthold Indian Reservation that were flooded by the Construction of the Garrison Dam in 1946. Photographs, 1898-1953: 16 photos of reservation activities created by the Wind River Agency. Photographs, ca. 1914 - ca. 1936: 300 photos recording daily life of Native Americans at the Fort Totten Agency in North Dakota. Photographs, ca. 1930-ca. 1949: 5277 photographs documenting projects, including Civilian Conservation Corps-Indian Division projects, from the Standing Rock Agency. Photographs, 1920-1965: 735 photographs documenting residences and projects, including Civilian Conservation Corps-Indian Division projects, on the Lake Travers Indian Reservation in North Dakota and South Dakota (Sisseton Agency). Pine Ridge Agency: Miscellaneous Photographs, 1923 – 1955: Over 2,000 black and white photos from the Pine Ridge Reservation in South Dakota. Includes photos of building projects, farming and industry on the reservation, cultural events, and individuals. Main Decimal Files, 1900 – 1965: 26 photos documenting life on the Pine Ridge Reservation. Cheyenne River Agency: Photographs, 1900 – 1960: 87 photos from the Aberdeen Area Office of the Bureau of Indian Affairs. Glass Negatives and Photographs, 1911-1939: 65 images documenting the Flathead Irrigation Project in Montana. Industrial Survey for the Southern Ute Agency, Colorado (Decimal Files, 1879-1952): 19 photographs documenting "homes, farms, and general life of a band of Southern Utes"
Central Photographic File of the War Relocation Authority, 1942 – 1945: Several photographs of residents of the Colorado Indian Reservation, which housed a War Relocation Authority center for Japanese internees in WWII. Surveys of Indian Industry, 1922: 132 photos of Chippewa and Potawatomi Native Americans posed with their houses. Each photo includes a list of all the members of the households, their occupations, and observations about their work habits and personalities. Photographs of the Inhabitants of Metlakatla, British Columbia and Metlakatla, Alaska, ca. 1856 – 1936: During this period, Tsimshian lived both on federally recognized reservations and independent villages. Minneapolis Area Office: Photographs, 1920 – 1971: 13 photos of from rural Minnesota, the Turtle Mountain Reservation in North Dakota, and Talihina, Oklahoma. Classified Files of the Extension and Credit Office, 1931 – 1946: 46 photographs documenting the agricultural activities of the Office of Indian Affairs Division of Extension and Industry based in Salt Lake City, Utah. Desk Files of the Tribal Operations Branch, 1934 – 1951: 32 photos from the records of Gerorge P. LaVatta, a BIA field agent. Photos document Native Americans working on the Hoover and Boulder Dams, Indian schools, and events at the Fort Hall reservation. DOCUMERICA: The Environmental Protection Agency's Program to Photographically Document Subjects of Environmental Concern, 1972 – 1977: This series includes several photos featuring Native Americans at work both on and off reservations. These photos are mixed in with photos of many other subjects. Henry Peabody Collection, 1890 – 1935: 10 photos of Hopi and Wichita Native Americans. Central Classified Files, 1927 – 1952: About 20 photos documenting forestry activities on reservations supervised by the BIA Phoenix Area Office, including Hopi and Navajo projects. Of course, this blog post is far from comprehensive- for any researcher, a thorough perusal of the National Archives catalog is an absolute must. For more tips on searching for digitized records in the catalog, check out this post on Expanding Your Digital Toolkit. Researchers interested in records described in the catalog that haven’t been digitized should get in touch with the appropriate National Archives reference unit using the contact information at the bottom of the page.